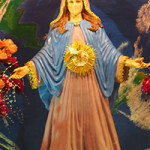 Mother Mary appeared in a very brilliant light at the ‘grotto’ at the house of Visionary Valerie in the first Luminous Mystery, in the 6th Hail Mary and the apparition took 14min. Mother Mary is very worried about how to world is being destroyed by evil. This message comes from all My heart for you, My children. Did you notice that a day goes by much quicker than ever? As quick you must also start dedicating your lives to My Son Jesus. This means start a new life filled with faith and regretful. I know that you wish to succeed one day. You all will receive a well-deserved divine gift that comes from heaven to earth for you. Remember that you all need to enter the Celestial Glory. Don’t choose the wrong path, which is the darkness. Remember that life isn’t easy anymore, it’s filled with obstacles and that hinders you of succeeding in life. Don’t lose patience, don’t let anyone take away your peace of heart. All that you want to do for Me, for My Son Jesus, for the Angels and Saints, is welcome. Don’t be sad, don’t cry, don’t fall and don’t let anyone depress you. If you are lonely and if there’s no one to talk to you can fall into depression. Let your mind stay strong and stable for all that is coming in towards the earth. My children, something that I want to tell you is that there is a lot of pain and sadness in the world, which is worrisome. A lot of people are just living to live. There are bad things happening and they’re not talked about to bring clarity. Soon many signals will come and many of you are not prepared for what is coming. A tremor will come in the world and after a profound silence, after that there will be a loud echo. There will also be a very bright star in the skies and after this a loud sound will come from the ocean, which will roar among all the stones. Many of you don’t know how serious this is. Walk everywhere with your Rosary and pray wherever you go, because prayer is now your solution and your hope. Run to ask for forgiveness before the moment arrives. Do penitence, fast, good deeds, go to Church, go to adoration at the Holy Sacrament of the Altar. Don’t remain with everything for only you but share with your brothers. Don’t become a bad person, but be humble and blessed filled with the light of the Holy Spirit. Life is hard and many people don’t have enough to live by. Don’t lose hope, because you will be helped. Calamities will come, that is why you should prepare for your food, because life will become more difficult than ever. Remember to start planting and raise animals. Make sure that you have water, lamps and boxes of candles. Nothing will remain hidden in the world any longer. Everything will become clear in due course. My Son Jesus is already going with all the sins in the world so you can ask for forgiveness to remain free of sin. You have to give account at the final judgement. Be always happy with yourself and with others. Don’t insult and reprimand others. Wake up in the morning, kneel and read your Bible to start the day well. I and My Son Jesus have chosen Koyari with all our hearts so it can become a place of pilgrimage and penitence. Many of you receive help and you don’t return to Koyari, the place that have given you assistance. My children you’re not late for coming to Koyari so you can convert. When you come to Koyari you will surely be helped. Your Mother, the Virgin of Grace of Aruba who loves you forever.